Ever since we decided to give up our car almost two years ago, grocery shopping has been quite an ordeal at the Chophouse. Sure, we could go to the farmers’ market, but we’re not really a fan of being forced to go shopping every Saturday morning. And besides- while fresh local produce is great, we also need things like toilet paper, club soda, canned beans, and laundry detergent. We could skip the farmers’ market and do all our shopping at the grocery store, but the logistics of getting all we need back home, as well as the crowds and loyalty cards and weekly circulars are an awful lot to deal with. And we still find we’re eating veggies from Mexico and China and making extra trips to specialty stores for gourmet or exotic items. 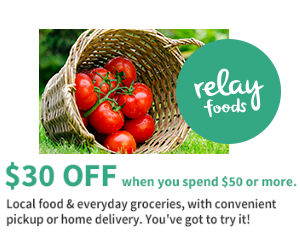 This is why we’re quickly becoming addicted to ordering groceries from Relay Foods. Our first order from Relay Foods. Tastes as good as it looks. Founded in Charlottesville, VA in 2009, Relay expanded into the Baltimore market about a year ago and has dramatically simplified and improved our grocery shopping experience. Unlike other online grocery operations whose approach is sort of ‘Well, here’s our supermarket’s inventory. Go ahead and order something and we’ll throw it on a truck next week.’ Relay provides the best of all possible shopping experiences by teaming up with dozens and dozens of local suppliers of fresh produce, dairy, meats, gourmet soups and sauces, coffee and tea and even handmade prepared foods. Not only is navigating the Relay website and filling your cart ridiculously easy to do, it actually gets easier each time you do it. We like to treat it like a digital supermarket, shopping by category one ‘aisle’ at a time. Sometimes we even ‘shop backwards,’ filling our cart with anything that looks tasty and then deleting items to fit our budget, or adding things throughout the week as we realize we need them. But if you’re trying to shop quickly you can fill a cart on the fly by perusing Relay’s best-sellers, seeing what’s on sale, or reviewing your previous purchases. After getting a feel for the site you can even mark items as favorites and build specific lists- great for things like baby products or hosting friends for Ravens games. Still not fast enough? 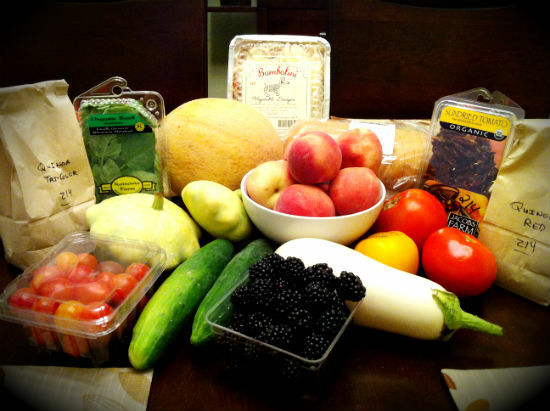 You can even shop CSA style with two of Relay’s most popular items: the Virginia’s Bounty Basket and Local Tasting Box. Get one of each and you’re good for the week without getting off the couch. And we mean that literally. With home delivery to Baltimore 3 days a week in a two hour window you never have to get off the couch. Delivery is a mere $10, which works out to being less than even the cheapest cab ride back from a supermarket. They also offer the option to pick up your order at one of three (and counting) locations around North Baltimore. Want to save even more? First time users can click on the banner and save $30 on a $50 order. That’s like getting enough fresh, local ingredients for a small dinner party for twenty bucks! With prices that are right in line with a grocery store or farmers’ market, and convenience and service that can’t be matched anywhere, the Relay van is going to be a familiar sight on our block from now on. We’d like to thank Relay Foods for sponsoring today’s post. For more information or to register and place your order visit www.relayfoods.com. This entry was posted in Food and tagged Baltimore, Convenience, CSA, Delivery, Farmers' Market, fresh, Groceries, Local, Local Tasting Box, Maryland, Organic, Pickup, Relay Foods, Small Farmers, Virginia's Bounty Basket. Bookmark the permalink.